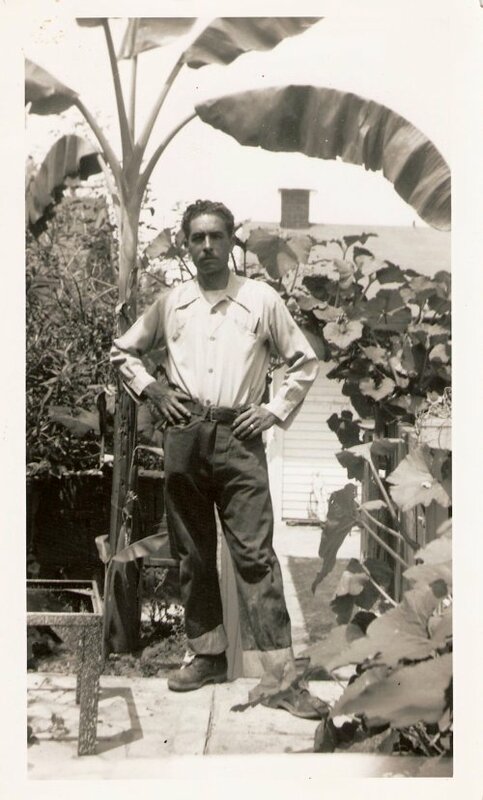 My Grandfather Atanasio, like many other Mexican men was a drinker, a gardener and a tinkerer. Often he would combine all three activities into one afternoon. His inspiration resulted in a backyard of mosaics and fountains (a whole post on this coming soon). Although he passed away in the late 70s many of the plants he grew live on today at the old family homestead, including a great big walnut tree – a favorite of the neighborhood squirrels. In this photo, he is standing next to what looks like a freshly planted banana tree. Generations of this banana tree live on today, each succession of pups churning out hanging bunches of fruit. This small grove of bananas was divided and spread around the garden, at times the trees were on the verge of taking over swaths of the backyard. The trees are easy to maintain but they do need to be kept in check. About ten years ago I decided to take a pup (a baby banana plant, they reproduce by sending up shoots from underground rhizomes) home and planted it in a pot. I thought I would carry on the banana growing tradition at my home. I never had a proper place to plant it until I moved to my new place a few years ago. The tree grew tall and flourished, sending up 4 or 5 new pups in one year. I looked forward to harvesting my first bunch of bananas, until one morning when my landlord knocked on the door with a request. She asked if I would remove the banana tree. I told her not to worry the roots were very shallow and would not damage the foundation. She then said Chinese people do not like banana trees and it is bad luck to have the trees growing on her property. As to not offend her and my Chinese neighbors and because it was more a demand than a request, I removed the large banana tree and replanted the pups in pots. I now have a couple of pups in pots I do not need and would like to keep this banana family going. I’m sure my grandfather received his pup from a friend and so I will continue this tradition. If you would like a banana tree for your garden, leave me a note in the comments area. i’ll take it if it’s still available. hit me on facebook. I’d like a banana tree! I would so take a pup if I had anywhere to keep it.